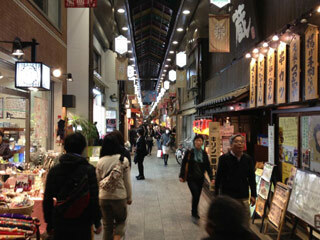 Nishiki Ichiba Shopping District (錦市場商店街) is an arcaded shopping street located in the middle of Kyoto, city. It has a history of over 400 years that makes it one of the oldest shopping district in the history of Japan. The street is about 400m long and there are over 120 stores. It is definitely great spot to enjoy shopping Japanese daily glossaries and foods in Kyoto. 1. use Karasuma Line to Shijo Station. The street of NishikiIchiba was constructed in end of 8th century. In 1311, several fish markets opens their stores at this street. It became market place in 1615. In 1984, they replaced the floor to stones, and constructed new arcade. Today, there are many food markets, such as vegetable, meat and fishes. Also, all kinds of stores of Japanese daily meals, sweets, teas and Sake. Especially, it offers all kinds of Kyoto delicacy. Not only the food, there are many fashions, daily glossaries and restaurant.